15 DELICIOUS D.I.Y. Wedding Projects That Will Inspire You! Is “unique” the keyword at your wedding? Well, a few DIY projects will definitely give your day personality and a sense of style that’s 100% you! 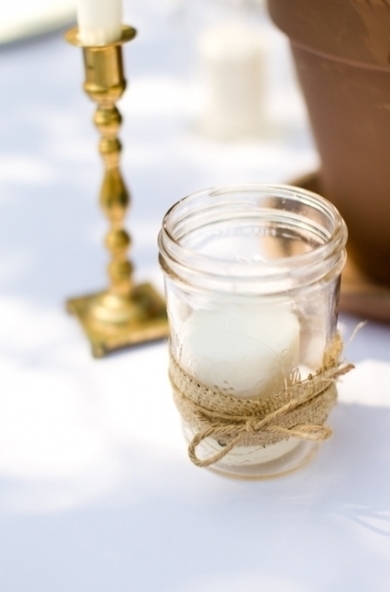 To get your creative juices flowing, we’ve rounded up fifteen of our favorite homemade wedding projects that will seriously inspire you. 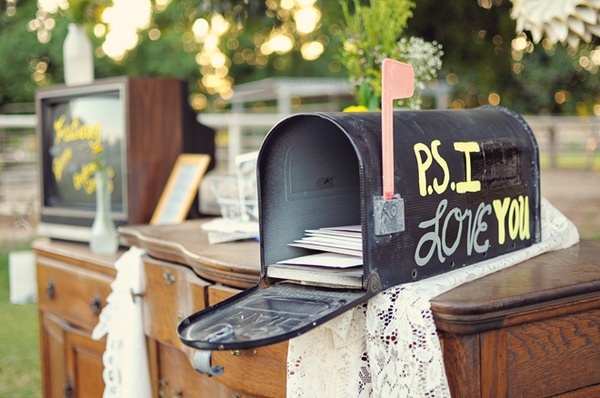 Snag a vintage mailbox at a flea market or thrift store (or rough up a new one! ), than paint a sweet message on it and set it out on your gift table. 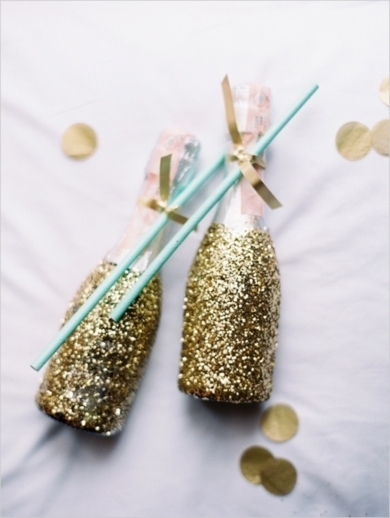 Coat the bottoms of mini champagne bottles with glitter paint, or start with an adhesive and roll the bottles in glitter. 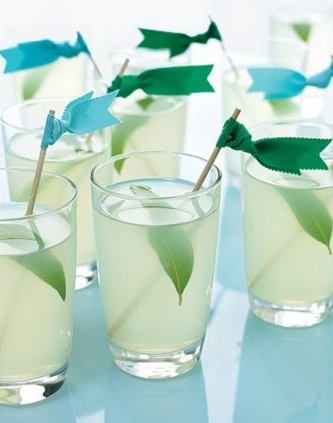 Attach straws with a matching ribbon to complete the favor! 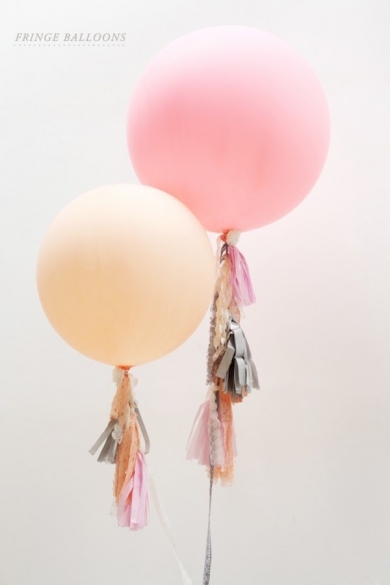 Make tissue paper tassels (following this tutorial) in your wedding colors—and throw in a few metallics to add some shimmer. 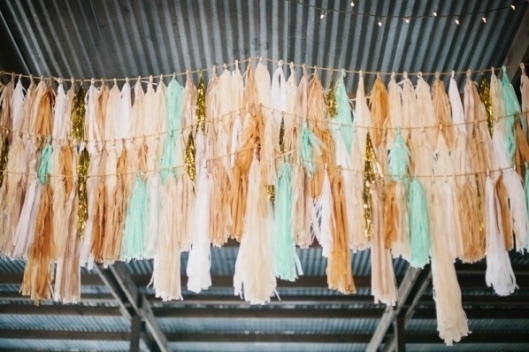 Attach the tassels to a string or wire for some seriously swoon-worthy decor. This one is just so easy! 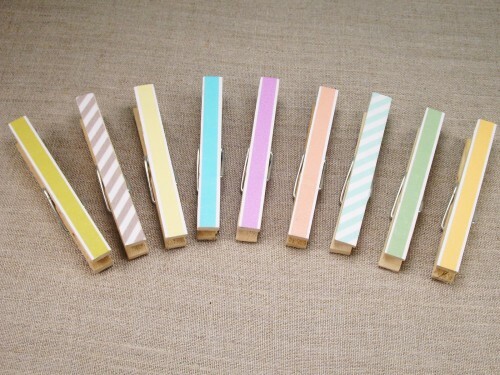 Trim pieces of colorful washi tape and adhere them to clothespins. Use them as place card holders or to secure favor packages. This project will take a little more dedication, but if you follow this tutorial, you’ll end up with the most memorable DIY save the dates ever! 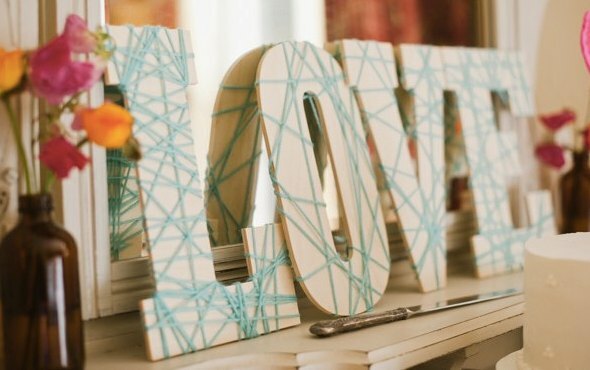 Purchase simple wooden letters and a skein of yarn at a craft store, then go crazy! Use wood glue or another adhesive to secure each end of the yarn to the back of the letters. Trim pieces of burlap and twine to fit around vases and votives. Tie the twine tight to keep the decorations snug. Bonus: Try incorporating lace or another fabric for added interest. Even amateur sewers can manage this one—the less-than-perfect style adds to the charm! 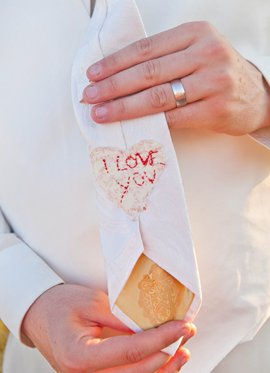 Embroider letters onto a patch of fabric, then stitch the patch to the back of the groom’s tie. Just be careful that the stitches don’t show through on the front. 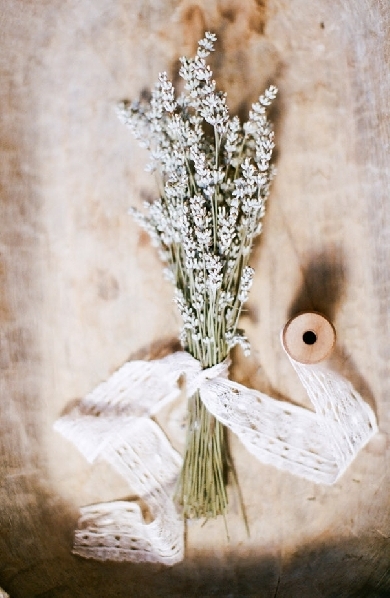 Gather some fresh or dried lavender and tie a bunch together with a dainty lace ribbon. This could work with any variety of flowers, but the delicate nature of lavender works well for DIY bouquets. 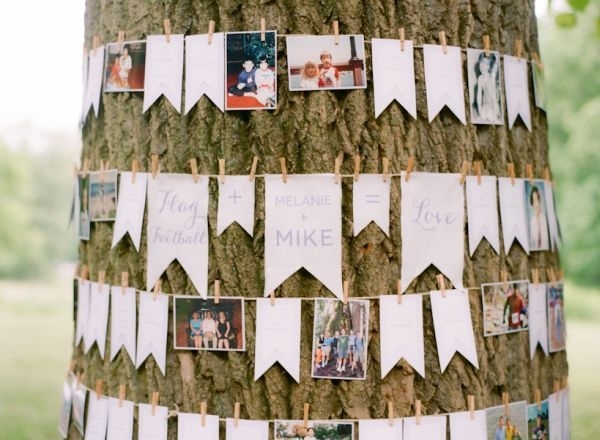 Print photos of you and your sweetheart (or family photos), and cut pennants out of fabric. If you’re up to it, you could even try printing sweet sayings on the fabric. Then, attach the photos and pennants to string with mini clothes pins and hang the banners for super personalized decor. Print a message on a business card-sized piece of paper. Use an X-Acto knife or a hole-puncher to slice two small slits in the middle, where you’ll slide in the sparkler. Only two materials are needed for this DIY: dowel rods and ribbon. Cut the dowel rods to stand about two inches higher than your drinkware and tie on artfully trimmed ribbon. Who says balloons are only for birthday parties? Adding tissue paper fringe (as shown inthis tutorial) amps up the typical decoration and makes it totally wedding appropriate. 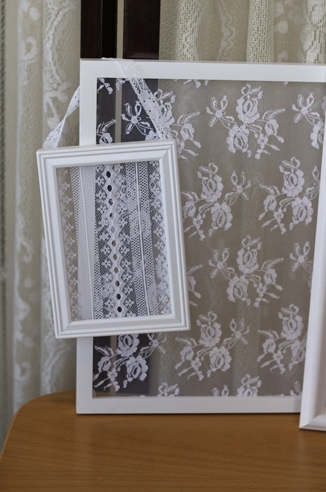 Remove the art from frames and substitute in pretty lace! 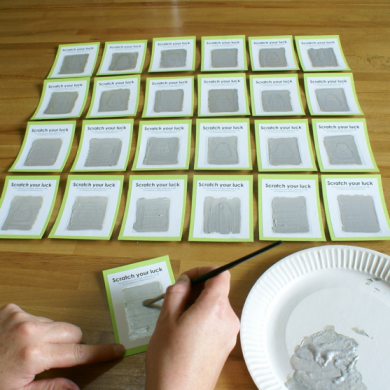 Attach the fabric to the back of the frame with glue, staples, or another sturdy adhesive. By mixing up the size of your frames and the lace prints, you’ll end up with an eclectic, vintage look. 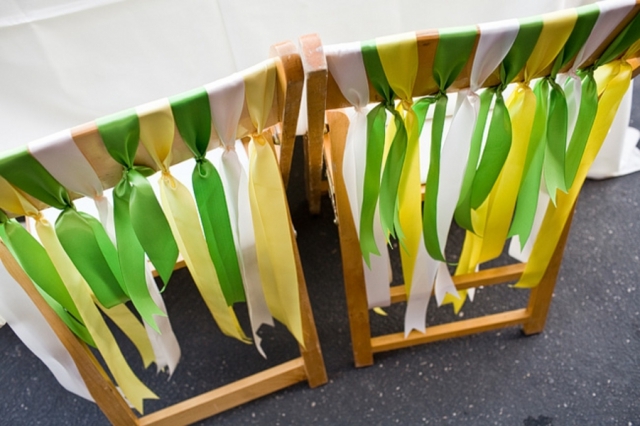 Cut colorful ribbons to a variety of lengths and tie them around the backs of garden chairs to add a pop of color to your ceremony or reception space. Be sure to add pointed ends to make the ribbons looked polished! Pro tip: This DIY may seem easy, but it is time-consuming! Don’t plan to add this decor to every seat in the house unless you’ve got loads of time (and materials).